Worried about the security of your hotel room when you travel? You never really know who else has a key to your room, or how good the locks and deadbolts actually are. Luckily, there are several easy, inexpensive ways to secure the room more effectively. Here are five of the best. The simplest way to add extra security to your hotel room is with a rubber door wedge, and many travelers swear by them. They're cheap, take up almost no space in your bag, and can be set up in just a few seconds. Simply place the thin end under the door jam, then gently kick the wedge into place to secure it. Door wedges work best on hard surfaces like wood or tiles, although some do come with a Velcro strip to stop them from sliding on carpet. For extra security, you can also buy models that come with an alarm that will sound when the wedge is disturbed. The door you're securing has to open inwards for the wedge to be effective. Most hotel doors do, but it's something to bear in mind. Check prices for door wedges on Amazon. 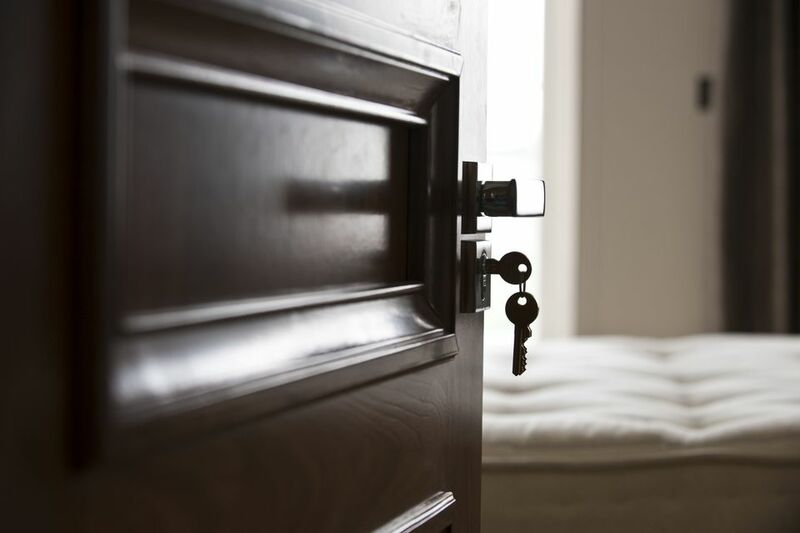 Another straightforward approach to securing your room is by using a portable door lock. These come in a number of shapes and styles, but they all work in a similar way, preventing the door from opening inwards. Again, for that reason, they won't protect you when the door to your room opens out into the corridor. Most portable locks have one piece that fits into the metal plate where the existing latch or lock goes, and another that sits across the back of the door. When locked in place, these prevent the door from opening unless someone physically breaks it down–not the most subtle of approaches. A few portable locks take a different approach, with a piece that slides under the door jam, and a plate that screws down onto the floor. When someone tries to open the door, the horizontal force is transferred into vertical pressure that just secures the lock more tightly in place. Like door wedges, they work best on hard surfaces. You'll get some protection if your room has carpeted floors, but not as much. Check prices for portable door locks on Amazon. If you'd like to protect more than just the entry door to your room, consider a motion detection alarm. These infrared sensors can be placed facing a window, door, or anywhere else in the room (other than your bed), and will alarm when they detect movement. Make sure you choose a model that has sufficient range (at least ten feet, but more is better), and will automatically re-arm itself if you're planning on using it when you're out of the room. If you're protecting a window, be aware of flapping curtains and swaying tree branches when choosing the right position for the alarm. Some can also be used as personal security devices, with loud alarms that can be quickly activated in an emergency, so look for that feature if it's important to you. Check prices for motion detection alarms on Amazon. While it won't prevent access to the room, a door alarm should scare away all but the most determined of thieves. There are different versions, but a common type hangs from the door handle, with two metal prongs or blades that are pushed between the door and its frame. When the door opens, the prongs come apart and a loud alarm sounds. It's a simple but effective technique, with the advantage that it will work on any door type including those that open outwards. These alarms typically only take a few seconds to set up, so you don't need to spend ages messing around every time you leave or come back to the room. This is one good, inexpensive option on Amazon, but there are many others. Finally, if your door has a deadbolt, but you're concerned about staff and others still having access with a spare key, the Lock Locker will help set your mind at ease. It's a two-part device, with a long flat section that fits around the handle and a round piece that fits over most deadbolts. Check prices for the Lock Locker on Amazon. Could this device keep you secure in your next hotel room?